I came to Berlin in the summer of 2011 while on my trip around the world. I’d been traveling for about a year at this point. After spending a month in Vietnam and with my bank account dwindling, my tax refund from my previous year of employment showed up. It was with that last little splurge of cash that I booked my plane ticket from Hanoi to Berlin. And it was that money which I used to fund my short-lived Eurotrip. Because while my original plans included a summer traveling around Europe, after spending one week in Berlin, I knew that this was the place for me. Berlin is my home now. I love returning here after a trip. And while you’re reading my blog about my various trips around Europe (and further abroad, on occasion), know this: the vast majority of the time I’m really just here in Berlin. Living my day-to-day life and doing all those oh-so-Berlin things which have come to define me. The city might not always reciprocate its love, but Berlin is mine. My home. My love. My Berlin story begins in June 2011 when I arrived in Berlin just a few days ahead of the annual CSD gay pride parade. That first week in Berlin still stands strong in my memory. There were long summer nights, a brief romantic fling, free festivals in the park, public drinking and a bit of sightseeing too. I stayed mostly with Couchsurfers during that week and it’s probably because of my kind and gracious hosts that I realized it was perfectly possible to stay in Berlin longer than intended. But I didn’t stay just then: I kept moving. Onwards to Prague and Vienna, until I realized — why am I still traveling? I realized during that brief Eurotrip that I just wasn’t having as much fun as I had had the week before in Berlin. So I returned. And sitting in my dorm room hostel, I spent hours searching for a suitable apartment to rent. After a few days of searching, I got lucky and found a room to rent for a month. I vowed to give myself 30 days to see what would happen. It was the remainder of my travel money so it was now or never. During that first month I lived in Berlin (documented in a fun-to-read but very casual daily blog online), I split my time between having fun and working hard. I went out clubbing as often as I could (which was quite a bit), met new friends at bars and meetups, had movie nights and spent time hanging out in Berlin’s many beautiful parks. But I also worked hard: I spent my afternoons (because I also got a lot of sleep that month) trying to find a job, which I ultimately succeeded in. The job was just a 3-month contract internship (as I’d come to learn so many jobs in Berlin actually are) but it turned out to be a great way to get initiated into the city. I hated the company (and still do) but it was my foot in the door that is Berlin. From that first summer in Berlin to today, I’ve had a strange and interesting time in Berlin. I’ve worked for various startup companies either in online marketing or graphic design. I’ve taken German language classes, worked freelance, traveled frequently and thought about leaving. This summer marks three years in Berlin — which is incredible when I stop to think about it. Berlin was never in my plan. GERMANY was never in my plan. And yet here I am. And with my new 2-year residency visa, Berlin is likely going to remain in my future for time still to come. Planning to move to Berlin? Join Internations.org for free to meet and network with other expats! Is there any better time of year than a summer in Berlin? I don’t think so. I had always wanted to live abroad at some point in my life (it’s part of the reason why I had studied abroad in London and in Sydney during college). When I was working as a graphic designer in Boston for a large, international company I quickly learned that the best way to get a job and live abroad was to just go for it and make it happen myself. I saved up some money and eventually was able to afford quitting so that I could travel and see the world on my own time. The original plan included moving to Australia at the end of my trip, but when the time came, I suddenly changed my mind. Europe was calling. While backpacking around the world, I met other travelers and backpackers who had nothing but amazing things to say about Berlin. Many of them, after meeting me and getting a sense for the types of things I liked to do, told me flat out that Berlin was just my kind of city. Never having had an interest in Germany or Berlin before, I decided to just take a leap of faith and show up as a tourist to see what all the fuss was about. Turns out everyone was right: Berlin is incredible. The city has its problems, for sure, but right now, right here, the city is so full of potential and has this incredible energy it’s hard to imagine myself anywhere else. When people hear the word “Berlin” it usually conjures up an image of a very open-minded and liberal-thinking city. And for the most part they’d be correct. Thanks to its healthy reputation from the 1920s as a bit of a gay mecca, the city seems to have a pretty good history with that kind of stuff. It’s also got a reputation as a party destination thanks to its legendary nightlife (ie, Berghain – “best club in the world“), but I think what a lot of tourists might miss out on is the fact that this is a living city. There’s this cultural movement here – Berlin today is adapting and evolving. Even though Berlin is Germany’s largest city, it’s also still growing. It’s what makes it so exciting and interesting to be here – to be a part of the change and see the change. Some of the above has been extracted from an interview I gave to PASSPORT Magazine earlier this year. You can find the full story about gay American expats on their website. Hi Adam! Your blog is really inspiring. I have moved to Berlin in January, but my working alone from home and the winter didn’t motivate me to enjoying as much what the city has to offer. Well, now I’m looking for a new job and the weather is better. I think I should be out more often. When you are in town and would like to have a coffee, let me know! It’d be awesome meeting you. Have a great weekend! Great post about Berlin. My wife and I always wanted to live abroad, and she was able to finagle a move from NYC to London, where we have been living for the past 18 months. The ex-pat life is certainly interesting, but the opportunity to travel is the biggest reward. I have heard nothing but great things from other people about Berlin, so we need to make it over there soon. What a really cool story! I am happy for you! I have big dreams of living abroad someday. I’m 32 and from middle-of-nowhere Minnesota. I actually have an interview for a job in Berlin! I’m freaking out I’m so excited. If I get it I might have tons of questions for you, which of course you can choose to ignore because I’m sure you get tons of questions all the time and are very busy. Anywho, my job would be in Friedrichshain so I’ll probably look for a flat or flat share near there. My husband and son will come later in the summer so then I’ll get a bigger place and have an idea where we should live and have found an English-school for our 8th grader in the fall. I’m excited to follow along with your blog and read more about Berlin and your travels. I’ve been greatly enjoying your website, as I too am in love with Berlin. I lived there in the 1970s and then started returning again and again since 2005. I’ll be making another trip this May to introduce my girlfriend to this magical city as well as perhaps finally lay groundwork for a permanent relocation back to the city on the Spree. One quality that I always feel there is that I am truly a free human being. Don’t know if I can explain it, but that city liberates people, or allows th m to liberate themselves. Hi Don – thanks for the kind and thoughtful comment. I can’t even imagine what Berlin like was in the 70s – it must be so interesting to have that history to compare it to today. Excellent point about liberation and freedom in Berlin – it’s something I feel here as well. This sounds sooo amazing and gives me hope about the possibility of actually turning my dream of living abroad and travelling the world into reality! Glad to hear it’s inspirational Fiona. Good luck following your own dreams! Next month I’ll be in Berlin for my first time… I hope to feel the same as you felt… I am really excited about the trip. In fact, I’m already travelling by many blog, including yours, which I recently discovered looking for “Berghain” in Google. So, I’ll tell you about my experience in Berlin soon. Oh, two other things: I identified with you cause I really want to live abroad, but I still don’t have a good plan, and I saw that you want to come to Brazil this year… come and visit us!! It’s incredible!! Hey Isis – thanks!!! Cool that you found me because of Berghain <3 Love that place! And yes - Brazil is high on my list to visit this year. Just hope I can find a good enough deal on airfare to make it happen. Why had we never seen this post before! We have been wondering about your Berlin story. Congrats on making the move Adam! Wow, I know exactly what it means when you stay longer that you intended. I like your blog and the stories you tell. It’s nice to read about other expats and how their lives work out. May I ask how on earth you got to stay longer after your first 30 days there? Did you find a job? If so, did you have to change your visa? Hey Nico – Thanks :) And yes, I came to stay a month, and during that first 30 days I had a job offer at a startup company so was then able to stay longer. In the end I ended up working as a freelancer and getting that specific visa. You can find out more about it on my blog’s FAQs. Great that it worked out. I love Berlin as it is so modern compared to many other cities and the nightlife is amazing. I have only ever gone for 3-4days each time but I always want to return. I think Berlin is such a dynamic city that it’s easy to return and still experience completely new things! So true. Berlin is such a brilliant city that it really gets under your skin. I used to live in both London and Prague but Berlin was the city that called out to me most and like yourself, I live here as an expat. ‘Loving it all the way. I spent several days in Berlin back in 2010. To be honest, I was expecting a chaotic city, as many big capitals I had visited up to that point. Wow! I was completely wrong. Berlin is, along San Francisco, the most amazing city I’ve ever visited so far. Even kept thiking for a while on moving there! Hey David, thanks for the nice comment! I always love hearing stories of how Berlin was a surprising city for a tourist. Also funny to hear how many people have spoken about wanting to move here! I haven´t been to Berlin yet but everyone seems to think it is amazing. I also here it is cheap (a plus) and has great foreign food (huge plus). This might be my kinda place! I’m doing the same thing as you and following that burning desire of mine to live abroad. I’ll be in Spain this fall in La Rioja and can’t wait to be there, especially after last year’s plans to go took a hit. At least I saved up more money now! I haven’t been to Berlin, but Berlin and Germany are definitely on my list for this upcoming year! I’ll let you know once I have plans to visit. It’d be great to meet you, Adam! Berlin is definitely a great city to be an expat in, and it’s great to hear your story. Like you, I knew the only way to do it was to make it happen myself, and I never imagined I’d be so happy. Fate sent me to Seville, but I’ve chosen to stay! Berlin is a GREAT city to be an expat in! I never imagined this is where my life would take me, but what a ride it’s been! Nice to hear you say “every time is like the first time,” Franca. I think you’re right because Berlin is constantly changing and that’s why I love being here. To be a part of that change is very exciting. Das ist aber doch SO Berlin! Lovely. When I visited Berlin for the first time in 2008 with Zab, I knew in the back of my mind that I could live there. Just a shame that wasn’t really a possibility I was open to at that time…it would’ve been fascinating to see from the inside how it’s changed since then. Hahha, yep. I love the evolving nature of Berlin, it’s certainly part of what has kept me here! 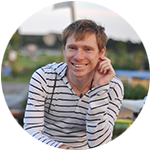 Adam, inspiring story… great idea on sharing how Berlin chooses you. We share somewhat of a similar story. I was solo backpacking Europe last winter, and although Berlin wasn’t even my most favorite city I visited, something about it told me I should move there. You’re right – there is something truly special about it and I can’t wait until I get to experience this Berlin summer! Hi Tee! I just searched through my inbox and found your email. Now I realize you’re the one with the very cool “Hire Me, Berlin” website. Glad to hear everything worked out so far – let’s definitely connect! I, too, immediately fell in love with Berlin when I was there last summer. I totally get the “living” vibe you mentioned – the city literally does feel like it’s moving and breathing beneath your feet. I loved the history and seeing how the city has changed over the years. If I had to pick a base in Europe (and assuming that I’ll never be able to afford London), Berlin would definitely be a major contender! I remember reading about your enthusiasm for Berlin on your own blog Amanda :) I think one of the reasons Berlin attracts so many international people isn’t just because it’s affordable but because it’s a constantly evolving place. and what a great decision you made! Berlin is amazing! Thank you Rebecca. Sometimes I wonder if we choose the city or the city chooses us…. I visited Berlin in 2011 and ever since I’ve been dreaming of moving there. How did you resolve the visa issue? I thought you needed a job first to get one? Hi Adelina, I first wrote about getting my visa here. With some part-time and freelance contracted work I was able to prove enough of an income to get a residency & work permit. Interesting to read your story, especially as it’s so similar to mine but with Amsterdam! Right now I’m at the beginning stage you described, frantically trying to find somewhere to live. Having visited Berlin for a few days at Christmas, I really enjoyed the city and can see why you love it. Definitely somewhere I want to return to! Hey Julia! I didn’t realize you were now living in Amsterdam! It’s such an exciting time, moving to a new city/country/continent. And after having visited Amsterdam a few weeks ago, THAT’S a city that *I* want to return to! Enjoy this time Julia!! I don’t think I’ve ever heard the story of how you ended up in Berlin, so this was really interesting to read. From our 3 months up there, I can definitely understand why you fell in love with the city. If we ever decide we want to try living somewhere else in Germany, Berlin is our first choice. Hah, funny we had the same time frame! I arrived in Berlin in August 2011, stumbled upon it during a Eurotrip in 2010 to visit a friend and I didn’t even know it was supposed to be cool then! I was planning on going to Stuttgart, but then my friend moved to Berlin. Thank goodness for that! Very cool Nicole – didn’t realize we’d been here about the same time :) Thank your lucky stars you ended up here rather than Stuttgart, hah! And finding the right city can really be a challenge. I feel very lucky to be able to live in the city that I want to live in. Sometimes you just have to follow that feeling, I love that it’s worked out for you! Sooooooo when can I come to Berlin and experience this awesome nightlife with you?